I absolutely refused to see this film at the cinema when it came out because to begin with it was only available in 3D. In general I’m not a supporter of 3D films. It’s not new technology and in my opinion it’s rarely needed. If the film is relying on 3D to bolster ticket sales, then that’s worrying. Leading with 3D as Dredd did, on all of the posters, was also worrying. I don’t think Dredd needed 3D, I think it was a big enough character, big enough name, big enough world to get by without it. Anyway, after a few weeks, cinemas started releasing it in glorious Two Dee, but only late at night in my local area and not very often. Did this ultimately hurt it at the box office? I think so. Also I believe the 3D was retro-fitted and it was not all shot in 3D, so that was an extra cost that the film didn’t need. After the last Dredd film with Stallone, which I’ll come back to later, people old enough to remember it were wary. 2000AD fans were extremely nervous and some members of Joe Q Public might have gone to see something else instead of paying an extra couple of pounds to see what, in their minds, was yet another comic book film. 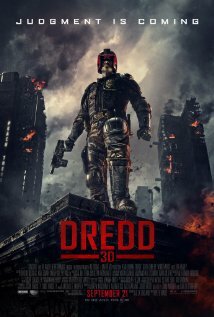 At the moment the new Dredd has made 35 million at the box office worldwide on a 50m budget. My opinion aside, something didn’t work as well as it should. Before watching this film I read a fair bit about it, had watched a couple of trailers and was very excited. I was also very pleased to hear Karl Urban, the NZ hunk, last seen by me in Star Trek as Bones, say he would not be taking off the helmet. It was one of many gripes about the Stallone film. We’re not supposed to know what Dredd looks like. He’s faceless and it’s his will and unrelenting appetite for justice and his name that inspires fear. To me he’s a more extreme version of Batman in a dystopian future where killing criminals is something he does on a daily basis and doesn’t feel any regret. So, having done my homework and knowing a reasonable amount about the character and the world, I sat down last night to watch. Overall I was pretty impressed by the film. I thought it was engaging, exciting and I came away wanting more. Urban was excellent as Dredd. He was grim, had a great chin and scowl, his voice was rough without it being Batman rough, and his depiction of Dredd’s unbreakable faith in justice and law and order was great. I’ve never seen Olivia Thirlby in anything before but I thought she did a really good job as the rookie Anderson. She was tough, but she also brought a naive and slightly child-like quality to her performance as someone on the cusp of fully embracing the law and all that comes with it. Such as carrying out lethal judgments on people on the spot. While Dredd may never hesitate, she shows how much he has already lost because she was emotional and she cared, even about those who were trying to wipe her out moments earlier. Bit of a spoiler, but there was also a moment where Anderson scans Dredd with her telepathic powers and she picks up on his emotional state, someone full of rage, and she hints at something else under the surface. I’d kind of like to know what it was, but I also think you’re not supposed to know. It’s like finding out what he looks like under the helmet. Sometimes you don’t need to know every little detail about a character. On reflection I can see why this film didn’t deliver a record weekend at the box office and make everyone go back a second time. To me it felt very much like ‘A Day in the Life of Judge Dredd’. It was just another day, just another crime. At the start of the film the rookie picks a target and they go out and take care of it. That’s it. She could just have easily picked a different one and the film would have been a bit different, but not hugely. Given the post apocalyptic world, given the futuristic setting, given the larger than life character, I think people were expecting a story on a grander scale, more like a Prometheus or a Star Wars. The story was enjoyable, but it was everyday for Dredd. It wasn’t one tiny crime that was actually part of a much larger conspiracy which he investigated and that led into a plot to destroy the whole of Megacity One. It was a story about a drug dealer trying to flood the city with her product, protect her home and industry by getting rid of two nosey but determined Judges. For all that was wrong with the Stallone Dredd film, and there was a lot which I won’t detail, the core of the story was much bigger. The elimination of naturally born judges and birth of a new race of genetically created and severely unbalanced Judges all based on the DNA of Rico, who wanted to change the whole of Megacity. There were explosions and lots of gunplay in both films, and mercifully the light touches of humour were black in Dredd 3D and there was no comedy sidekick this time, but the scale of the threat was pretty small. What epitomised it for me is when Anderson looks out across the city and we can see several other Megablocks with their own names in neon down the sides and you realise this is just one story, in one Megablock, in a giant city that stretches from Boston to Washington DC. I know several other people have compared Dredd to The Raid, and have said the latter is a better film. I’ve not seen it so can’t compare, but part of me thinks they shouldn’t be comparable movies. As I said, I did enjoy Dredd, but it felt like a very small story in a giant setting. It’s like getting out a massive piece of paper and then only drawing in one of the corners. I know what comic book fans and experts on all things 2000AD might say, but the film is something divorced from the comic. It should true to the heart of the source but it should also be different and epic. Yes, you absolutely can have small and personal films on the big screen, but they don’t feature a big bloke in a helmet with a giant gun on the poster. Dredd at the cinema should be a grander story, told on a grander scale. I would love to see another Dredd film more along those lines, but unless Dredd does really well on DVD and blu-ray, I don’t think we’ll see another one for at least another17 years or so. Overall definitely worth seeing, and it’s a great action film, but I would suggest you go with the right expectations and then you won’t be disappointed.